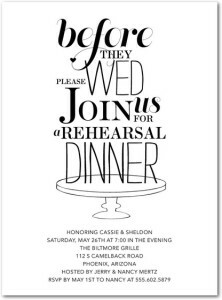 Your wedding rehearsal dinner invitations are an important part of planning your wedding, mostly because if no one shows up at the rehearsal, you have no idea how the wedding will go. 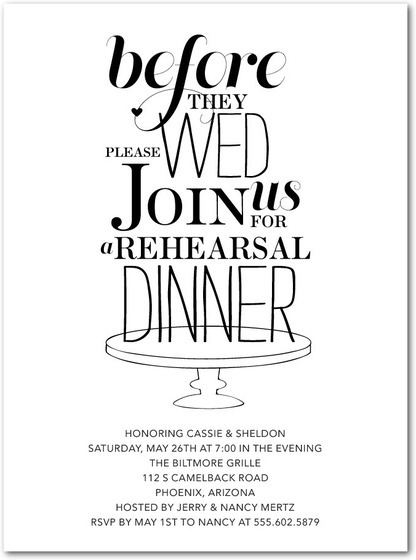 While it is up to you to consider whom to invite, and how to phrase your wording, you can cheat on finding the actual invitations and find a range of very affordable printable options that you can have printed, or print at home. 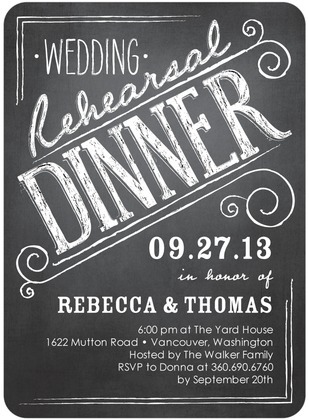 The following include ten of the most affordable places to find rehearsal dinner invitations. 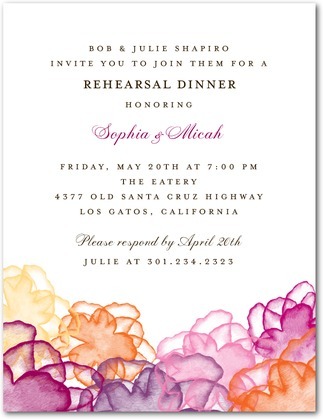 While most people wouldn’t think to look on Amazon for rehearsal dinner invitations, or invitations of any kind for that matter, the site frequently has very good deals on pre-printed invitations and printing kits. It is important to shop carefully as many of the options on Amazon are a little pricey, but many are also very affordably priced. 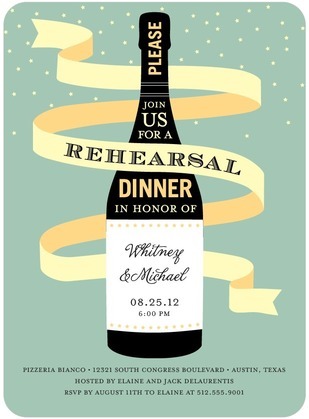 The best thing about buying rehearsal dinner invites on Amazon is that usually they do not have to be printed or folded after purchase. 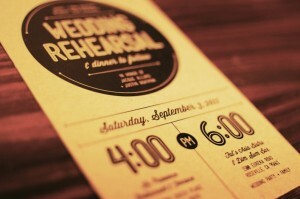 Pinterest is another place that most people wouldn’t think to look for invites but there are plenty of options there. Pinterest is often used to pin cards so by clicking on an image, you can usually go to the store where it is sold. 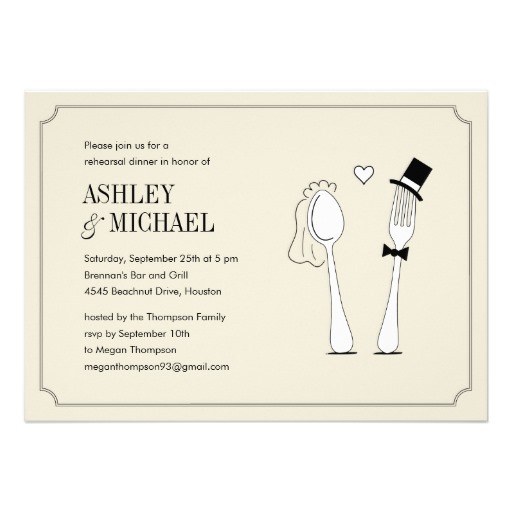 Other options are printable, so all you have to do is size the image to the dimensions you want your invites to be, and then print onto cardstock. 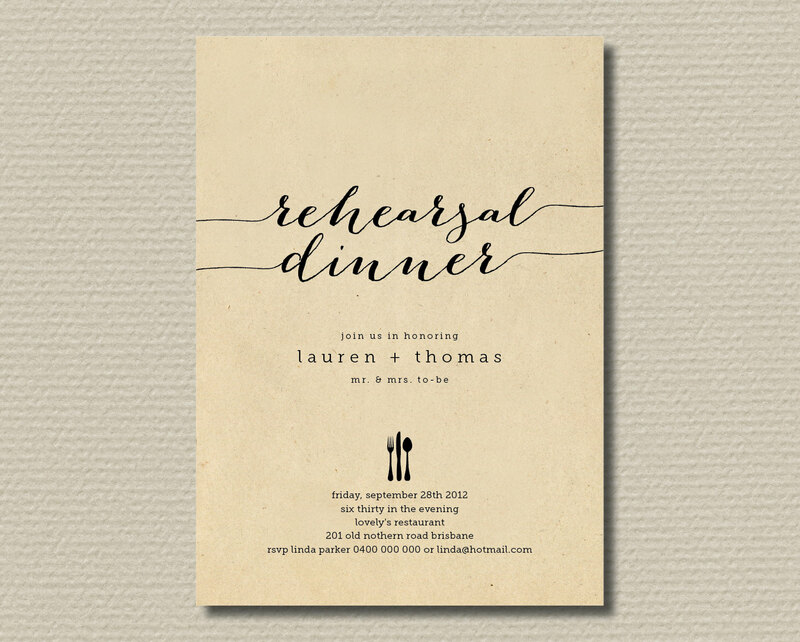 Minted.com is a website dedicated almost entirely to a range of printing and card stock, and among their printables and cards are a huge selection of rehearsal invites. Because Minted also has a number of other invites, the bride and groom looking to save time can consider looking for all of the cards they need right in once place. 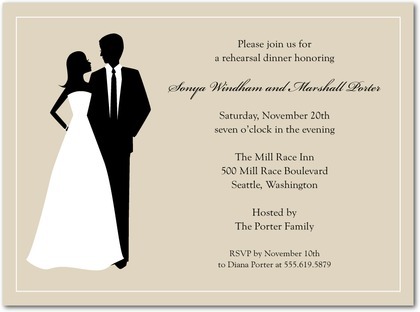 The site usually has more than twenty choices for rehearsal invites, as well as hundreds of other wedding cards to choose from. Invitation Box, like Minted, is dedicated purely to cardstock, printables, and cards. Anyone looking for wedding invites of any kind can definitely find them on Invitation Box, and usually for a great price. 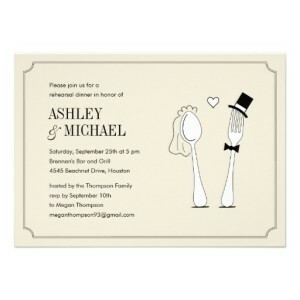 The site also has frequent sales on their large selection of cards, so guests can save even more. 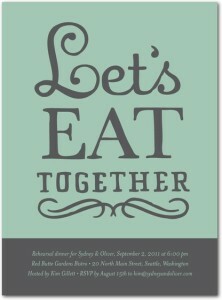 Mixbook is one of the best options out there for anyone who wants to create their own customized cards and invites. The site has a number of templates that you can easily customize with your own photos, as well as dozens of premade templates that you can use as-is. If you want your photo on any of your invites, Mixbook tends to make it easy and affordable, with most cards starting at just 89 cents. Usually Mixbook has 28 templates and themes to choose from. 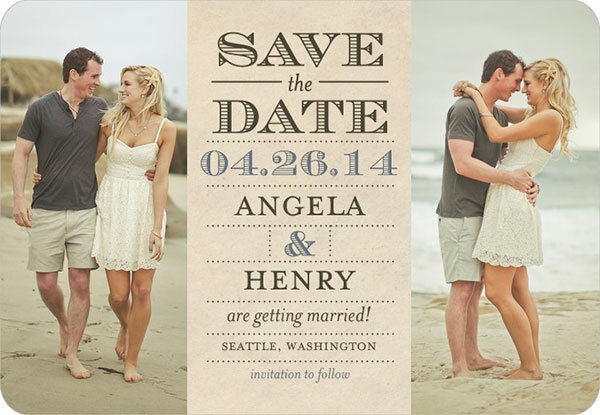 Shutterfly, like Mixbook, is perfect for anyone who wants to make their own customized invites. While the site can be slightly hard to navigate for some, it also features a huge selection of customization options, and can even be used to print photobooks before and after the wedding. Shutterfly does not have quite as many options as some competing sites, but they do offer very high quality prints for the money. 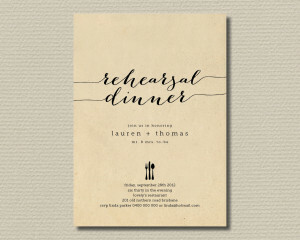 Zazzle is not always the cheapest option for rehearsal dinner options, but with over 6,000 premade options, and endless customizations, they are hard to ignore. The more you order at once, the cheaper prices are, and you can sometimes get sample prints before you place a large order. 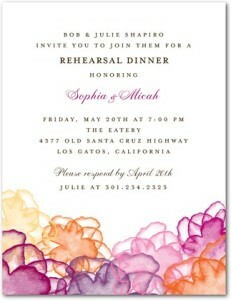 Zazzle is not usually affordable for small weddings, but for a large one it is one of your most customizable options. Vist Print is another big name in printables, and for good reason. They have hundreds of styles and operate in most countries around the world. Once again, Vista Print isn’t always the cheapest option for small orders, but for larger orders they make a great budget option. 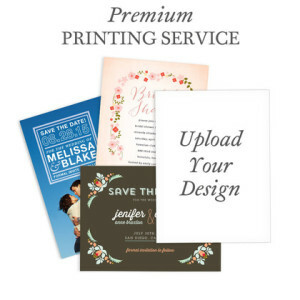 Buyers can consider that Vista Print does not have a huge amount of pre-made cards, but that they do have a great deal of customization options and layouts that you can work with. 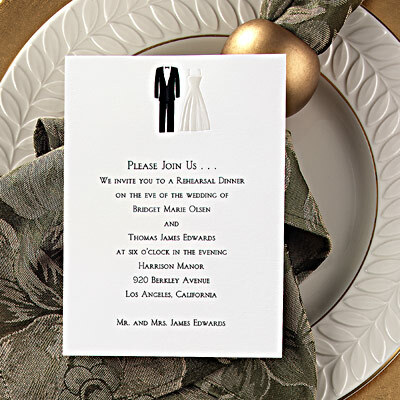 Wedding paper Divas is one of the biggest names in wedding printables, mainly because they have a huge range of classic and modern prints and styles. 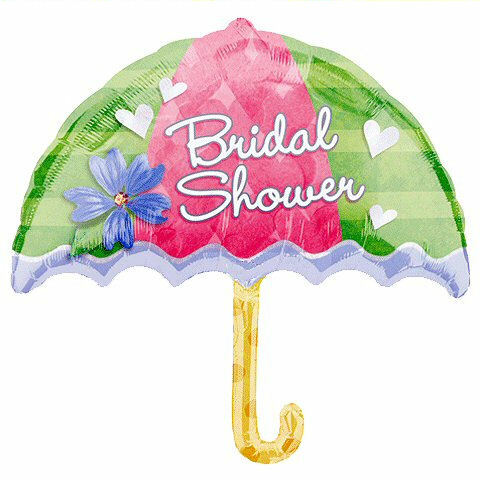 Wedding Paper Divas offers customizable and pre-made options, so the bride and groom can choose almost anything they want in terms of style, personalization, and appearance. 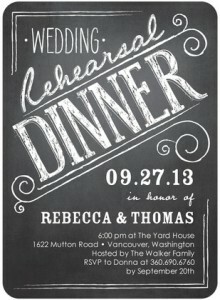 Wedding Paper Divas also has an excellent reputation for fast turnaround and great customer service, which is always a plus when ordering online. 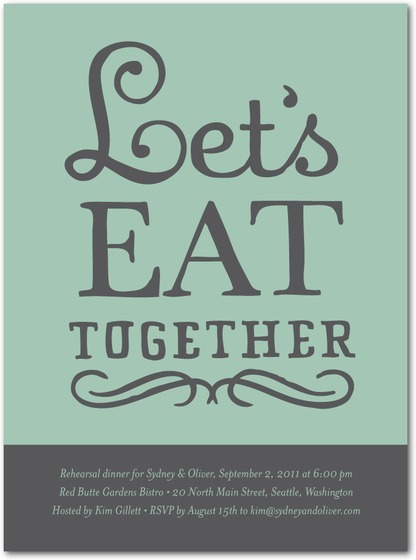 Etsy is the perfect place to go looking for rehearsal dinner invitations because most of the options are hand made and can’t be found at every corner store. If you’re looking for unique then consider a card kit, printables, or pre-made cards from Etsy. Usually prices are very affordable and you can find almost everything from Indie designers.